First of all we thank our media friends who made it possible for us to enter into the function hall. Since Chief Minister participated the security measures were very high and there are severe restrictions for entry. Neighbours envy… (invite card)owners pride! When we entered the venue it was 4.15 pm. As time passed there were heavy crowd of public and fans outside the auditorium who were trying their luck to get it. Those with invitation only were permitted on "Admit one" basis. We could see lots of fans gathered since the function details were already pasted through posters in the city. We could witness the jealous sight of others to the one who are going inside the auditorium. AVM arranged big screens outside the auditorium too for the benefit of others who couldn't get into the function hall. Thanks to AVM for such arrangement. By 4.45 pm we get seated and the audiences started pouring in. AVM Saravanan and MG Guhan was already inside the hall and he was standing in diaz and SPM was busy in arrangements. We could see the giant images of Kalaignar and Superstar on left and right side of the diaz. The graphics of the theme of stadium was stunning and colourful. Actor Jeeva with his wife, SA Chandrasekhar, Vadivukkarasi, Livningston and other actors who acted in Sivaji started coming. We were eagerly waiting for Superstar and we were planning a thundering standing ovation when Superstar enters the auditorium. Eppo varuvaen…eppadi varuvaen – Wow…how true is this! Minutes were passing. But Superstar is not coming. We lost our patience. (Imagine Muthu's first scene at which everybody waiting at pooja and searching for Superstar) We started gazing at the attendees there. Suddenly Supestar has come. We don't know when and how he came. But he was in diaz. We understood how true is the Muthu dialogue. (Naan eppo varuvaen…eppadi varuvaen….yaarukkum theriyadu….vara vaendiya naerathula correcta vandhuduvaen) This is not joke or just telling you for sake. 100% true. Thalaivar was in black pyjam in white stripes and white kurta and the dress was awesome. We had never seen him in this colour pattern. The ripen beard was just amazing. Superstar waved and wished the audiences on all sides from the diaz and sat in the chair. Shankar accompanied him. As per the programme schedule they started playing `Making of Sivaji' and it lasted for one hour. It was shown on the big flat tv screens which were placed on both sides of the diaz. The audio was superb. Sahana Hindi version – Wow…excellent! As the `Making of Sivaji' was shown in the tv, we got a sweet shock of hearing Sahana's Hindi version. The Hindi version is so nice and good to hear. Puruda News Anandan became very busy and whispered in our ear – "Hindi version is yet to be censored. They are showing uncensored songs and all. It is not ethics. They shouldn't do this and all." We simply said "Censoravadhu mannangattiyavadhu. There's no censor for us and nobody dare to censor us. We ourselves are censor board" His face become dark. Now, Shreya entered the function hall in a glamourous attire and fans welcomed her with great applause. She was very happy. Thalaivar saw her from the diaz and just waved his hands slightly lower to welcome her. This was a wonderful gimmick and could be used in any of future movies of Superstar. She straight away climbed the steps for diaz. And Raghuvaran seems to have got "feelings" after seeing her in such glamour attire. He shook his hands with her non stop and finally kissed her in hands. Fans saw this and there was a roar in the balcony. Again back to the `Making of Sivaji' clipping - Now the anchor in the clipping, Uma Padmanabhan said about the Advance booking records and opening crowd and the film's run in UK, Malaysia, Singapore, US, Australia and South Africa and Gulf. They some clips regarding fans' celebration. She also highlighted that the inauguration was so simple and there was no audio launch at all for the movie but it became headlines and shook the entire media for two years. And again Telugu spoofs songs were played. The firs night scence dance sequence clippings of the Telugu version were shown and it was really a laughter burst for us when we saw thalaivar as Nageswara Rao, NTR and Chiru. Thalaivar perfectly imitated them. And after that Deleted Scenes were shown. And really those scenes were rocking. Due to time constraint they should have removed them from the film. 3) Shreya – Ponnu Paakura scene. Meanwhile Superstar was shown very close up in screen and the crowd went berserk and took some time to settle down. Whenever Superstar's name was uttered or he was shown the same repeated. The `Making of Sivaji' came to end and after that there were no programmes for more than half an hour. Superstar got away from chair and went to receive Kalaignar at entrance. Shankar too took off. This dampened the energy in the hall and the organizers failed to keep in mind such gaps. They should have shown atleast some songs or clippings in the screen at this time to keep the audience roaring. Kalaignar arrived exactly at 18.10 amidst tight security with few ministers accompanying him. Superstar honoured him with shawl. Audience gave him a good applause. The programme kicked off with traditional `Tamizh Thaai Vaazththu"
The anchor for the programme was poet Nellai Jayandhan. He asked AVM Saravanan to give Welcome Address. AVM Saravana addressed all important participants and then said "If I spell this name it will take nearly a few minutes for the applause to settle down." The moment he started telling this, the crowd broke into applauds. He said that it is only Guhan who took care of whole production of Sivaji and he himself was just a puppet. He also cited that the day the Sivaji announcement was made, his brother Balasubramanian called him and said "Why risk at this stage and age? Look before you leap" Saravanan also said that it Ayngaran who helped him to rope in Shankar for Sivaji since they are good friends to him. He also said that Sivaji's re-recording track is in the making and it is about to hit the stands soon. He thanked Shankar for delivering a blockbuster and praised his dedication and concentration. About Superstar he cited about his simplicity and dedication and also said how simple he remained the whole shooting of Sivaji in two years and also revealed that he is a producer-friendly actor. Overall he said he is not just a manidha – he is a Maamanidhan. Soundharya Rajinikanth too received shield among them and when the comperer asked her to receive the shield from CM the crowd gave a thundering claps. Shreya received the shield amidst whistles in glamourous attire. When Shankar was called to receive the shield – and receiving it – somebody shouted from balcony "Shankarrukku vaazhvu koduththa Suppppppersssssssssssstttttttttaaaaaaaaaarrrrrrrrrrr." Shankar took this in very light sense and laughed. Superstar received the shield and again it took more than a minute for the applause to settle down. Whiel Abirami Ramanathan receiving the shield on behalf of the distributors somebody from the balcony shouted "Oru Ticket Aayiram Roobaikku viththaaaaaaaaaaaaaanggggggggggga" The audience burst into silent laugh because of this and I couldn't control my laugh. Suman was asked to deliver speech. He addressed all and before addressing Superstar – fans lost their patience and shouted "Thalaivara sollu….thalaivar sollu" He spoke in suspense that – he got fame in languages in short period and also got a new lease of life – only because of the man called Superstar Rajini. He said, "I thank Rajini anna for giving me such a wonderful role"
Haneefa (Nejamaavae kuththitaan sir!) spoke: I don't know fluent Tamil. Forgive me for that. After addressing CM he said that Superstar is not just a king – he is a chakravarthy – Karuppu Chakravarthy. He also said a thing he found in Sivaji shooting that "Superstar is a biggest actor and he himself not aware of that"
Writer Sujatha said a few words about ROBOT. (First speech about ROBOT in this function) He said that they are looking for a good Tamil name for ROBOT. And also reveals that he is a part in ROBOT team and wished to participate in ROBOT 175 days function. "Nijathil Superstar. Padathil en marumagan"
When Pattimanram Raja came to deliver the speech the whole auditorium got energized. He started : Nijathil Superstar. Padathil en marumagan. He said that he wonders how such a superstar of this stature remains so simple and behaves without any airs about it. He also said that their food and superstar's food remained the same throughout the shooting. That is no separate or special food for thalaivar. KV Anand praised thalaivar's simplicity and co-operation in the whole shooting. He said that he was ready he was ready whenever he was summoned to appear before the camera. Also cited that – "It will tough for making others to make come out of caravan. But for Superstar it is tough to make him get into the caravan"
"Avarudan nadithadhai vida padithadhu thaan adhigam"
He addressed our thalaivar as : Siru kuzhandhai mudhal kudu kudu kizhavar varai rasikkapadum superstar avargalae…. While referring KV Anand he said that he is just the camera size and couldn't distinguish him and camera and always hiding behind camera. It took a minutes for laughters to settle down. He also commented that Superstar was seen in the sets looking upon sky and thinking something. He said "Appadi ennathaan sindhipaaroe?" Superstaaroda elimai, adakkam, panivu….wow…I enjoyed this in shooting and became spell bound. Finally he signed off by saying Avarudan nadithadhai vida padithadhu thaan adhigam. When Shreya was asked to deliver speech the crowd went into berserk. Shreya didn't know how to speak in a diaz and that too when a state Chief Minister was there. She blindly started "Hai Welcome Chennai…." She said that is was a wonderful experience of working with thalaivar and thanked him for the opportunity and also she said that she's willing to work again in their combo. Vivek imitated Shreya while starting and said the same "Hai Welcome Chennai…" and said that he tested whether he gets the same applause if he speaks like Shreya.. He also said that the only difference is Shreya is wearing very less costume and he is fully covered. Referring thalaivar Vivek said that "Andrum Indrum Endrum Superstar ivar oruvar thaan" He also said that Sivaji the boss, Kalaignar the mass. He also admitted that Sivaji's success is not by fluke or luck or toss. It is a result of mere hard work by the Sivaji team. He also pleaded today actors that they should learn a lot from Supestar. He praised about his simplicity and food habits. "Bandhanna ennanae theiryahd aalu ivar. Ivar saapiduradhu ellma just a few fresh vegetables – the one that rabbits eat. And in mornig he take very light food. In noon just a few vegetable with curd rice and in night just an average food. He also said during the shooting of train sequence in Pune –Lonewala, it was time up more than afternoon and Superstar was there continuously acting even without lunch break. And they had the lunch only by 4pm. He also said that during recent Kuruvi shooting in Malaysia – a Chinese boy approached him and asked "Are you from Sivaji….?" He was awestruck by this and said Superstar now got strong fan base even in Malaysia and other newer parts of the globe. Na Muthukumar said in his address that "Kaandha Kangalal anaivaraiyum kavarnthizukkum superstar avargalae…." Now Vairamuthu came to deliver the speech. The man of the match award goes to him for delivering an extra ordinary speech. And that too before a Chief Minister. 33 aandugalaga Superstar naarkalyil amarndhiruppadhu enbadhu saadhanaiyillai – sarithiram. Adhuvum ilamai maaramal irupadhu neruppu sarthiram. 33 aandugal thiruyulagai aalvadhu sarithiramenil, 60 aandugalaga maakalai aalum innooer sarithiram thane adhai gowravikka vaendum? Adhu thaan Kalaignar vandhirikiraaar. He also said that Sivaji is a feather in AVM's crown. He again came back to the topic of Superstar and said "Oru Manidhan paesuvadhillai. Aanal paesappadugiraan Vilambaram virumbuvadhillai. Aaanal avan illamal vilambaramae illai. Avar Arasiyalil illai. Aanal avar illamal arasiyal illai. Vaaji vaji paadal paarkumbodhu, ungalodu aadum azhagiya pennai paarkamal unglai paarthaen….Ungalin indha ilamaikku kaaranam enna…? Unavu murai, vaazhviyal murai, appuram ellavatrukkum maelaga vellai manasu. Idhuthaan avar ilamaikku kaaranam. And again he said the he was speaking with him on his garden for more than 6 hours. While returning he was just thinking back about his chat with Supestar. "Avardan 6 mani nerathukku mael naan paesiyadhai asai podugayil – oru vishayaththai enni naan viyandhaen….andha 6 mani neramum avar oruvar patri kooda puram paesavillai. (Back biting). Thus he signed off. The crowd and the auditorium went berserk and nearly this was the longest applaud in that occasion and me was the last to settle down with the applause. My hands got pain for continuous applauds. He also said that he enjoyed Vaaji vaaji song where thalaivar pats his thighs. Thodaiyai thaatuvaarae adhai naan mighavum rasiththaen. Avar thodaiyai styleaga thatumpodhu dhoosu parakku. Parandhadhu dhoosu mattuma en manasum thaan. Arumai arumai nanbar Rajini avargalae. He also said that a man needs entertainment in life to get shelter under troubles and worries. And really the society needs such an entertainer. 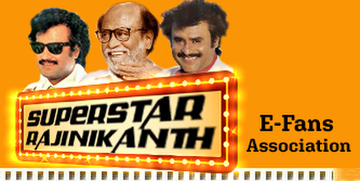 When there is a vacuum for such entertainer – Superstar fills yhat gap. My son once bought a key chain from Japan and guess what the key chain had Superstar's pic imprinted. That is his fame. Oru naalu anju varushathukku munnadi neenga pirnadhirakka koodadha?" He quoted several scenes from Sivaji where Superstar's performance was excellent. One of the scenes he pointed was : Court failure scene bfore intermission. Summa valiyai vaangi reaction panniyiruppaaar….adhu rumba nallayirukkum. Adhe pola police station treatment scene, a scene with Pyramid Natarajan…Born with car…? No…I just try walking bare….He also said he got maximum pat from shooting crew and public when he completed shooting the scene where Superstar signs in both hands in appointment orders. While we were penning the dialogue `Adhiruthilla' it just looked normal. But once Superstar uttered that in screen – it became a one word magic which became an all time hit dialogue of Superstar. Everybody in the unit worked hard for the success and so it became an international hit. He also thanked KV Aanand for taking part in all other aspects apart from his role. He uttered each and everybody's name in the Sivaji crew without fail. He also thanked us – THALAIVAR FANS – for making it such a big hit. (No others spoke about fans. He also said that he had been recently to Coorg for a story discussion and there a Tamil couple met him and said "Sir, Sivajila kalakittinga…Oru naalu anju varushathukku munnadi neenga pirnadhirakka koodadha?" Naan kaettaen…yeaennu…. "Neenga innum Superstarai vechu naalu anju padam eduthirupeengalae….." I became very pleased. The audience from balcony started shouting ROBOT…ROBOT… ROBOT paththi paesu…..So Shankar switched over his topic to ROBOT. I actually this time didn't plan to take ROBOT in Tamil since its budget is very hight. So, I moved to Hindi for that. But due to some difficulties I couldn't realize that in Hindi. Since the extra ordinary budget the film needs a Superhero of world fame. Now I got one such. Me and Rajini sir never expected joining back in such a short time. All happened unexpected. During Chandramukhi 200 days function I said that I will try to match this super hit film or above that. As I assured I gave a hit above Chandramukhi. Now the same I tell you here. I will try to match the Sivaji's success with ROBOT or will try more than that. Sakthiyellm ondru saerndhalae…sorghum varum indha mann maelae….All powers joined and it gave a block buster Sivaji.. Thanks to all of you….